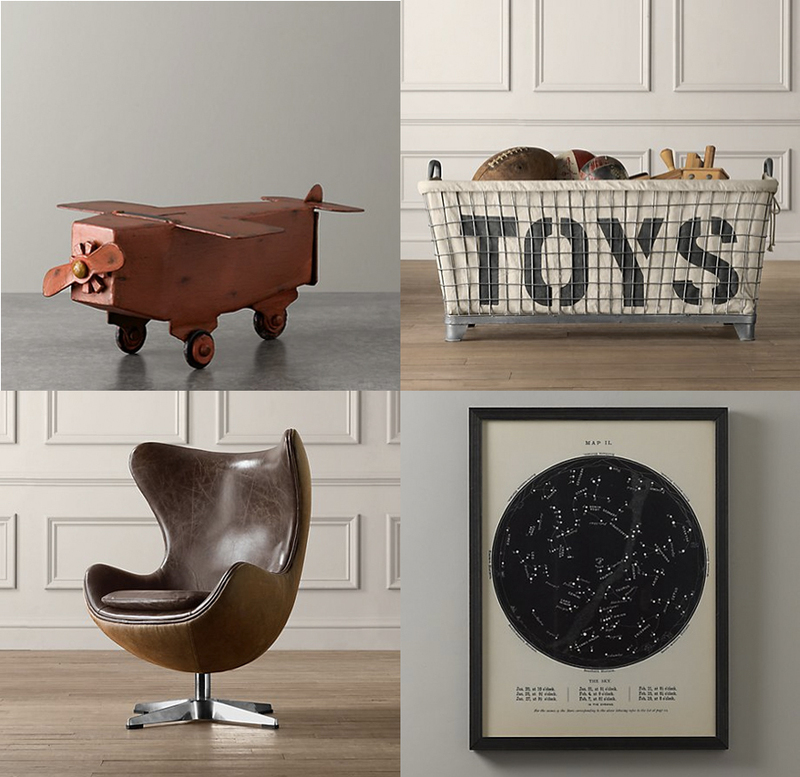 While I've never been a fan of Restoration Hardware's Baby & Child concept, I was recently taken back by one particular layout with a vintage, industrial theme. There are so many details to love--from the wall art, to the lighting, to the sweet globe on the shelf. It's such a fabulous look and let's be honest, attractive, well-designed boy's rooms are hard to find! (check out a couple more fabulous boy's bedrooms here if you'd like). You can view the entire RH bedroom here (that bedding!). Hi Steph - I love the latest RH catalog, especially the industrial playroom. I wrote about it on my blog last week, but I emphasized how much more fun it would be to find the *real* items at a flea market, instead of paying the crazy prices at RH. But either way, I am nuts about that industrial look! I am a huge fan of the vintage industrial look. Especially when actual vintage pieces are used. Would love this for one of my kids bedrooms the next time I redo. I recently came across some vintage reproduction national park posters on ebay which I think would be great in a boys bedroom. They also have vintage travel pennants which would be charming as well. Really? I think this is horribly depressing. The industrial laundry bins for toys and the sad monochromatic grey...it makes me think of an orphanage. No thanks. The girls' rooms are a little better but I don't know any little girl who would be thrilled with an all-beige bedroom.